Shelby Wild, a former fashion stylist living in a tiny New York City apartment decided to simplify her life by moving to Venice beach to enjoy nature and start up her own botanical hair care line inspired by California's laid back lifestyle. Meet Playa. The whole range consists of 5 essential products, everything you need to achieve effortless healthy hair without all the nasties that you tend to find in salon quality products. You won't find parabens, phthalates, SLS, fillers, artificial colors in any of these products just sustainably sourced organic botanicals. First in the range, the Every Day Shampoo, "clarifying shampoo gently foams to remove impurities while preserving your hairs natural oils". They also use coconut water to hydrate hair without it being heavy and sugar beet extract to promote volume and growth. Next up is the Supernatural Conditioner which cleverly self adjusts to comply with all hair types and how damaged the hair is. 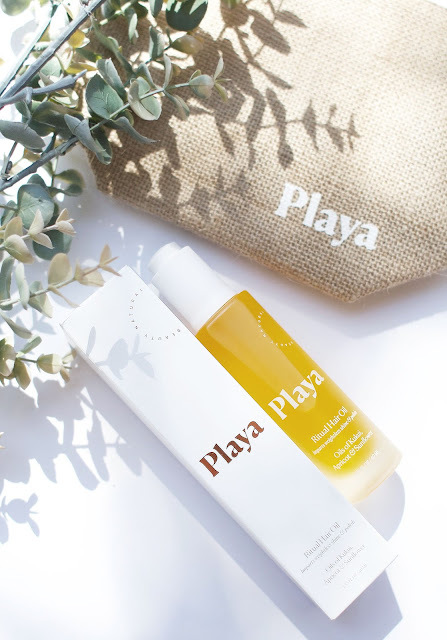 "Brassica and copaiba oils smooth frizz and impart sublime shine"
They both sound pretty dreamy to me, I always look for products to combat my frizzy and often dull hair. Ritual Hair Oil can be used daily on wet or dry hair to restore moisture and soften hair. The oil is a blend of coconut oil, apricot, kukui and sunflower oil to tame frizz and give hair added shine. It is also great for combating split ends and preventing UV damage. I love using oils on my hair as I have exceptionally dry and thick hair so I am super intrigued by this Ritual Hair oil. (FYI It smells so beautiful, sweet and fresh!) The bottle is super chic and has a dropper dispenser which I love, press once on the cap for the ideal amount. Pure Dry Shampoo revitalizes and freshens up hair instantly without buildup or residue and no white powdery marks. Rose powder is used to absorb excess oil and also kept my hair feeling soft whilst the star anise extract works to eliminate impurities. If you've read my blog for a while you will know I live off dry shampoo and I have tried and tested numerous amounts of products from drug store to luxury. 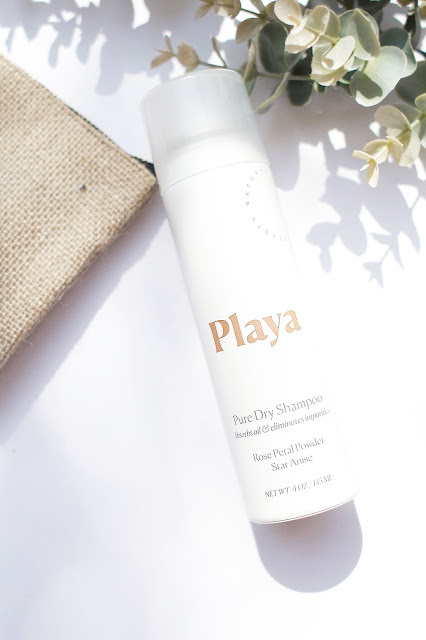 So of course as soon as I opened my parcel from Playa I tried out the Pure Dry Shampoo and instantly fell in love. It creates a beautiful texture without any residue or white marks in my roots. I've since put the dry shampoo in my yoga bag so I have it on hand after class when I really need it, this also means I can grab a coffee after my workout and not look too disheveled. Finally, I was sent the Endless Summer Spray which is formulated with southern California sea salt to give your hair the perfectly tousled texture. 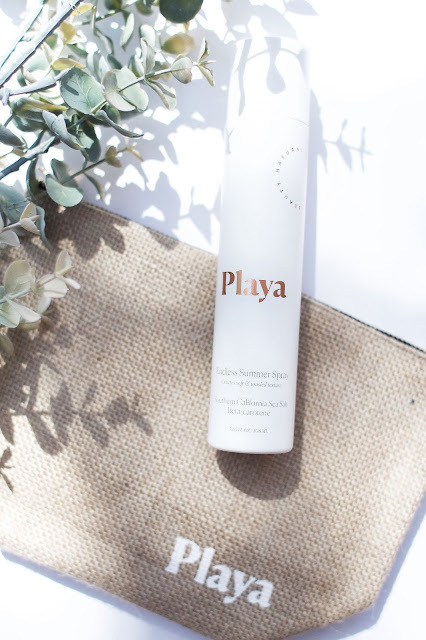 Playa uses "Marine Collagen Complex" to nourish hair strands and help achieve fullness and shine and natural UV filters shield your scalp from those harmful rays. My hair is often texture free, lifeless and straight mainly because I never really use styling products. I can not wait to experiment with the Endless Summer Spray and hopefully achieve enviable beach babe locks like Shelby. Healthy beauty products are making a real dent in the overly polluted beauty market as consumers are wising up to the benefits and just being more health conscious. I know I am the same, since finding out about my pregnancy I have been considerably more picky about what I use on my body. Shelby Wild has done an impressive job of curating such great essential hair products using recognizable botanical ingredients which smell great and actually work. The line is beautifully designed too featuring minimal white packaging with gorgeous bronze lettering, its simple and chic! Anyway, my point is, if you have Split ends your Hair won't grow! This is because the Split ends Break off, there for making it seem like your Hair never grows! Your Hair will not only look better but will feel super Smooth when your Hair get Trimmed.